Tail O' The Pup threatened??? Yup. Just got word of this today. The developer was planning to incorporate the 'pup but neighborhood pressures forced them to make design changes that preclude that. They are scouting alternate locations and working with the Conservancy right now. to me ... the neighborhood is responsible for moving the hot dog stand? The benevolent developer wanted to incorporate it? Somehow I think there's more to the story. At least it's protected and they can't just demolish it. New Digs for Tail O' the Pup? Internet gossip may complicate a possible relocation of the popular fast-food stand after it is forced from its spot in West Hollywood. Talk about the tale wagging the pup. 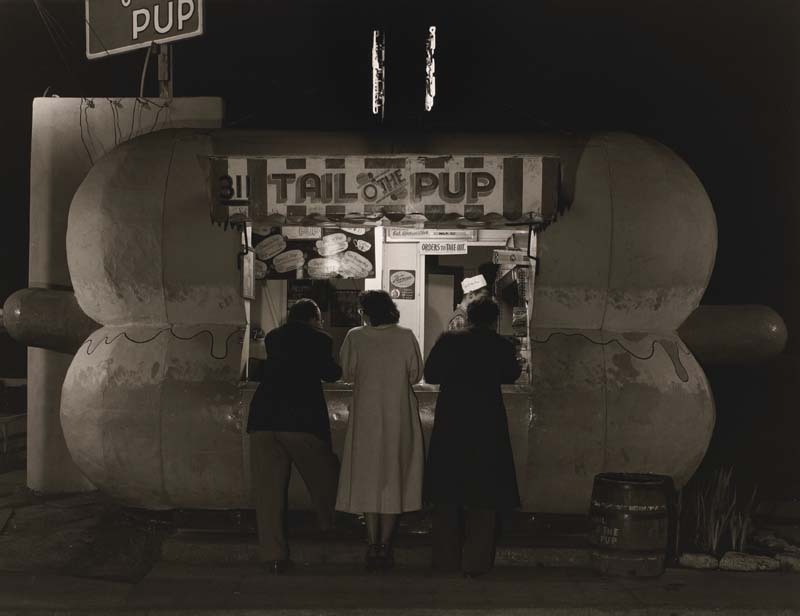 Quite frankly, the owner of the landmark Tail O' the Pup hadn't expected the story of the upcoming closure of his West Hollywood hot dog stand to be bandied about so soon. And with the word out, he certainly wasn't viewing his next meeting with his landlord with much relish. That's because Dennis Blake is still negotiating with the owners of the San Vicente Boulevard site on which his distinctive, hot dog-shaped eatery sits to move it to a permanent location. "We haven't told anybody. We haven't told anybody," Blake said, saying it twice Wednesday for emphasis. "We don't want to burn any bridges at this point. Landlords can be nasty if they want to be. But they have some other property they want us to move to." Blake fielded a steady stream of inquiries from news outlets after an Internet message board operated by food lovers reported that the stand was "being destroyed by a developer." The thought of the loss of another Los Angeles fast-food icon was hard to digest. "Stopped by the Tail this afternoon & I overheard Dennis Blake, the owner with his father, Eddie Blake, telling a diner that he is being forced to close in 30 days," wrote the anonymous "Westside Chub" on the Chowhound message board. "Maybe they can find another location to move the Pup just as they did the last time. Does anybody have an idea or location for these guys? Let's save the Pup." Actually, Regent Properties Inc. had already found a spot for the Pup in Westwood Village â€” unless someone rocks the boat before the deal goes through, said Blake, 53, of Westchester. "It's at a Broxton Avenue parking lot, near Weyburn Avenue. It could really work out well. There are a lot of things to work out though." Blake and his 81-year-old father, who retired from the stand in July, acquired the 59-year-old stand in 1978. They oversaw its relocation in 1986 after it was moved from its original site at nearby La Cienega Boulevard and Beverly Place to make way for a luxury hotel. The pair stored the 17-foot-wide hot dog facade, constructed from stucco-covered chicken wire, at an Alhambra wrecking yard for about a year before renting space on land owned by Cedars-Sinai Medical Center. Beverly Hills-based Regent Properties bought the site about two years ago, Blake said. It plans to develop condominiums and a retirement community for gays and lesbians, he said. Executives at Regent did not return a call seeking comment Wednesday about their hot dog relocation plans. But customers said they would follow the Pup wherever it goes. "I've been coming here maybe 25 years, and I'll keep coming," said David Arnold, a Redondo Beach police officer who lives in Santa Monica. Fine-art photographer Jesse Diamond, son of singer Neil Diamond and a 30-year Pup patron, said the proposed move was fine with him: He lives in Westwood. "This place won't permanently disappear. There will be a new location for it," Diamond said confidently. Blake hopes so. 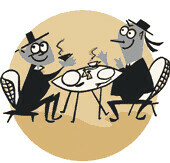 But he said he wished the Internet gossiper had talked to him first. Eavesdropping over a hot dog doesn't cut the mustard. .....Irv's Burgers people? Why haven't they organized a website and started petitions? Do we really want the 'Pup in.......Westwood?? i just went by 929 n san vicente to have one last guilty pleasure lunch at the tail o' the pup and IT'S GONE! when did this happen? west hollywood or westwood or oblivion? i can't believe that rat trap on santa monica blvd spawned a protest movement and a website, and the pup goes without a whimper! Drove down San Vicente to confirm what I heard tonight at the Los Angeles Conservancy Modern Committee holiday party in Holmby Hills: Tail o' the Pup's giant hot dog has been removed and the iconic stand north of Beverly Center is boarded up. Apparently the dog was placed in storage while talks continue over possible relocation to Westwood Village. Tail o' the Pup has been there since 1985, when it moved from La Cienega (where it had been since 1946.) The new owner of the property wants to build a home for gay and lesbian seniors. [* Regent Properties clarifies: "The project includes condominiums and an affordable housing complex that may be managed by Gay and Lesbian Elder Housing."] The Modcom party was at the former Gary Cooper estate designed by A. Quincy Jones. Now the home of David Bohnett and Tom Gregory, it was recently redesigned by Mark Rios and features a sweeping entry walk with a sculpture wall (by Brad Howe) so dramatic that it has its own website. Julius Shulman, the 95-year-old photographer whose exhibit continues at the Getty Museum until January 22, was among those in attendance. The Blake family, which has owned the Pup since 1975, put the stand into storage this week but has posted a message at the site promising that Tail O' the Pup will return. The family is taking a vacation break over the holidays and will evaluate its various site options for relocation early in 2006. Conservancy staff is in regular contact with both Regent Properties and the Blake family and will be monitoring this situation to ensure that Tail O' the Pup gets relocated appropriately and remains an important roadside landmark of Los Angeles. Thank you Ken for that update. Truly appreciated by all of us, I'm sure. They've long been holding the mustard and everything else at Tail o' the Pup, the landmark L.A. hot dog stand that continues to sit at a warehouse since being evicted from its home five years ago. Los Angeles' most famous hot dog bun needs a roll. Trouble is, Tail o' the Pup owner Dennis Blake doesn't have a place to roll it to. Grainy, blurred footage of a gagged and bound Tail 'o the Pup, covered in a blue tarp and cowering in the corner, appears in the new film Things that aren't here anymore 3, which aired recently on KCET. 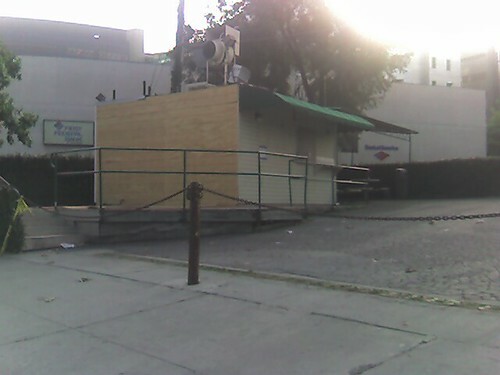 The owner claims to be waiting to find just the right spot to resurrect the beloved hot dog stand. All you realtors out there take note. Wow! In all of LA, there is no place for Tail of the Pup? It's not like it needs much space. Hi. Is there any update on this? I would like to see it come back and think I know a good location for it. Any idea how to contact the family?